Powered by a choice of six-cylinder engines, the Chevrolet Impala offers a roomy interior and a comfortable ride, but lacks sportiness. For 2010, the Chevrolet Impala drops the SS trim, while 1LT trims upgrade to fog lamps, Universal Home Remote, auto-dimming inside mirror, heated and power-adjustable door mirrors, and Bluetooth phone connectivity. 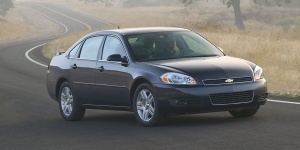 Find the used Chevrolet Impala of your choice from a dealer in your area. Search our used car listings now.